This post will be updated throughout the day with any developments. 17:10 We'll probably leave things there, unless there are any major developments. Well done to the hundreds of thousands who marched today. Organisers are now claiming it was in the top 5 largest demonstrations in UK history. 16:31 Huge Hessian Trojan Horse now a huge smouldering bonfire in Oxford CIrcus. Wonder if Troy had diagonal pedestrian crossings? 16:18 Hyde Park official rally winding down now, although some marchers are still arriving. An incredible day. 16:11 Can we just say, well done to the BBC. After an inappropriate focus on the minor vandalism earlier (cutting off from Ed Milliband's speech), they just spent the first 11 minutes of their 4pm bulletin talking exclusively about the peaceful march and rally. Balance redressed. 16:07 Fortnum and Mason appears to be the current front line for the occupiers. 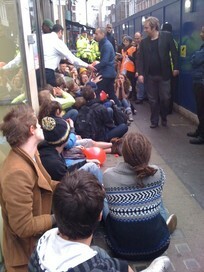 Around 300 people have occupied the building. Chants of 'You can stick your royal wedding up your arse', reported. 15.52 The RMT has a brass band and they're pretty good. Who knew? 15:42 The march is now approaching completion. Last of the walkers have passed through Trafalgar Square on their way to Hyde Park. 15:35 UK Uncut demonstration beginning in Oxford Circus. 15:29 A Liberty legal observer tells us they've heard an attendance count of 460,000 for the TUC-led rally. 15:17 According to @SteveCurran, "Hyde Park. Like a massive village fete. Brass bands, pensioners &Tony Robinson." 15:15 One splinter group going round trashing windows. Police seem to be doing a good job of holding back, but recording evidence to make later arrests. 15:04 Sounds like plenty of fun (albeit with a serious message) in Hyde Park. Only report of trouble comes from @KellyClark who's had her sandwich stolen by a dog. 14:53 Breakaway group now at the Ritz. It's getting a bit of a pelting. 14:37 Official march and rally appears to have been a complete success. However, TV aren't covering the rally, focusing on street disturbances. And so are most tweeters. Let us know what's going on in the park. 14:35 Reports of kettling on Oxford Street. 14:31 Sky reports up to half a million people may be on march. 14:24 HSBC on Charing Cross Road, Lloyds TSB, Dorothy Perkins and Boots on Tottenham Court Road reportedly among places protesters are trying to occupy. 14.21 The march continues, all peaceful and good humoured. Talks are no doubt still going on in Hyde Park, but we're only getting the unrelated skirmishes from BBC/Sky. 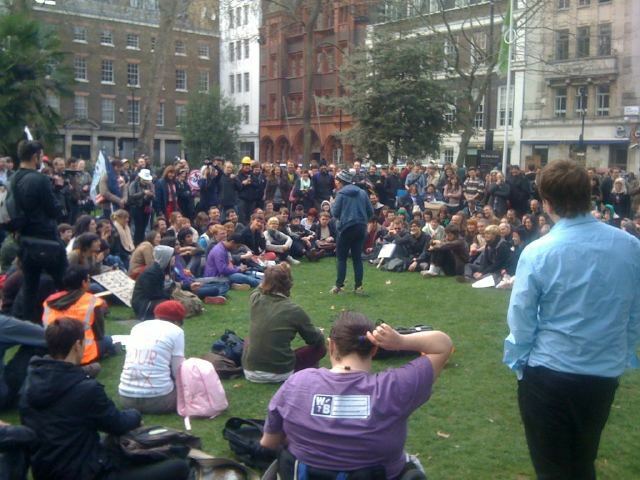 14:10 An estimated 500 people have assembled in Soho Square (including Josie Long and Mark Thomas) ahead of taking over a high-street bank for a comedy show. 13:58 Both Sky News and BBC News chose to cut away from Milliband's speech and the majority of protesters to show the paint-throwing minority on Oxford Street. 13:54 As Ed Milliband speaks in Hyde Park, scenes of smoke bombs, dancing and, above all, amateur photographers on Oxford Circus. 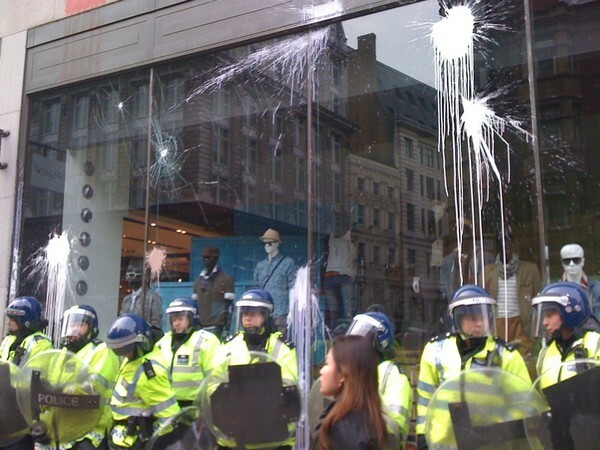 Topshop's getting a bit of a spattering. 13:45 Rally begins in Hyde Park; Brendan Barber, General Secretary of the TUC, is bellowing his lungs out. Ed Sillyhand is up in a bit. 13.14: Trojan Horse protest has reached Downing Street. Slightly surreal scene. 12.54: The head of the march has now reached Hyde Park. This march terminates here. Please ensure you have all personal belongings with you. 12.51: Fitzrovia News has some good footage of the student 'feeder' march moving off from UCL. 12.20: The head of the march has reached Regent Street area. The arse of the march is reportedly as far back as Blackfriars, thanks to a huge turnout. 11.47: Good to see the return of the vuvuzela. Think we speak for everyone when we say its versatile tones have been missed. One of the largest protest marches in recent years has just begun in London. Demonstrators gathered on Victoria Embankment have set off on a three-mile walk through central London in protest against the government's cuts agenda. The route takes them through Whitehall to Trafalgar Square and on to Hyde Park (annotated map here). The main march is organised by the TUC, and aims to be a good-natured family event. Over 1,500 TUC stewards will oversee the march to ensure safety. Meanwhile, 4,500 police officers have been deployed around London. No one knows how many marchers will turn out, but hundreds of thousands are predicted. The Guardian has a good roundup of the various interest groups taking part. Alongside the main protest, a number of fringe movements are hoping to grab some of the attention. 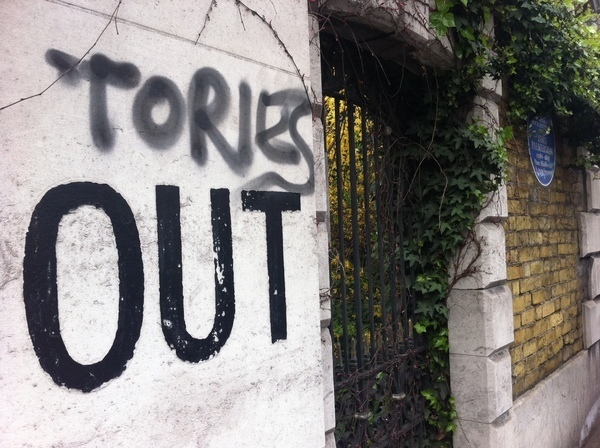 Boing Boing have done an excellent job of rounding up these events, which include a giant wooden horse in Camberwell and occupations by groups such as UK Uncut. Meanwhile unofficial 'feeder marches' will coalesce with the main march, including one from Kennington. 11.00 March assembles on Victoria Embankment.